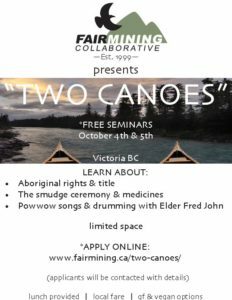 This morning, the Northern Secwepemc te Qelmucw Leadership Council (comprised of the Xat’sull, T’exelc, Tsq’escen’ and Stswecem’c/Xgat’tem First Nations, near the city of Williams Lake, BC) announced that they are adopting the mining policy developed by Fair Mining Collaborative. This policy, based on our Fair Mining Practices: A New Mining Code for British Columbia is comprehensive, detailed, and clearly spells out what is expected of industry and government when operating on Northern Secwepemc territory. For the mining policy, click here.